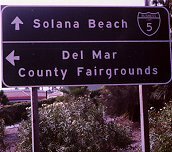 The Del Mar and Solana Beach business loop for Interstate 5 was established in the 1960s along Via de la Valle west from I-5 at Exit 36 to Coast Highway 101. The route extended from Del Mar north to Oceanside along Coast Highway 101 (County Route S-21) via Solana Beach, Encinitas (including Cardiff and Leucadia) and Carlsbad. Only two shields for the business loop remained as of 2016. They are located at the Interstate 5 and Via de la Valle interchange. Previously there was also a "Business Route 5 Next Exit" sign on the approach to Via de la Valle along I-5 north. That sign was removed during the Interstate 5 expansion project underway throughout the 2000s. Prior to Summer 2000, this Business Loop I-5 sign was in place along westbound San Diego County S-6 (Via de la Valle) ahead of the intersection with Jimmy Durante Boulevard. Roadwork at the time removed this sign. Photo taken in September 1998.
Business Loop I-5 split with I-5 north at Exit 36 to join Via de la Valle west ahead of the Del Mar Fairgrounds. Signs attached to the Interstate 5 overpass direct motorists to the fairgrounds ahead at Jimmy Durante Boulevard. Photo taken 04/23/06. A loop ramp takes motorists from Via de la Valle (San Diego County S-6) west onto I-5 south toward Downtown San Diego. Photo taken 04/23/06. Jimmy Durante Boulevard arcs south from Via de la Valley around Del Mar racetrack and fairgrounds to Camino Del Mar (old U.S. 101) ahead of Downtown Del Mar. Photo taken 04/23/06.